Monday, April 3, 2017 — Matt Gerhard ’08 is director of music at Kokomo Zion United Methodist Church in Indiana, as well as being an accomplished organist, pianist and conductor. 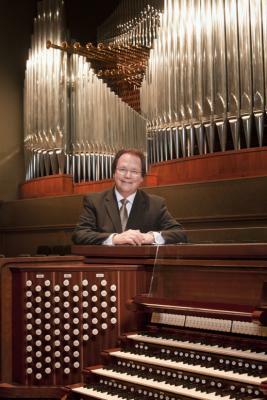 He began studying organ with William Brown on a three-manual Austin pipe organ when he was a freshman in high school. While a student at Olivet, he studied organ with Dr. Timothy Nelson and traveled with The Olivetians ministry team. He also studied organ with Dr. Beverly Howard at California Baptist University. The music of the Church has always been important to him. This recital series honors the memory and musical career of Dr. Ovid Young ’62 (pictured left), who passed away in 2014. An Olivet alumnus, he is remembered by many as a beloved performer, teacher, mentor and colleague. A pianist, organist, composer and conductor, Dr. Young had to his credit more than 7,000 performances in major concert halls, churches and colleges around the world.